Prosper is one of America’s two well known Peer to Peer (P2P) lending companies. They provide a way for individual borrowers and lenders (regular people like you and me) to make loan agreements between each other, using Prosper’s platform to broker the deals. As a borrower, all you have to do is fill out the easy application. You’ll quickly find out what interest rate you will be offered for your loan proposal, and within days you can have the money in your bank account. See Prosper Benefits and Sign UpGet competitive returns today! Like competitor Lending Club, Prosper filled a hole in the marketplace: fast loans to qualified applicants, and investing opportunities for qualified lenders. The system has been purring along for more than a decade now, and Prosper now enjoys an unprecedented reputation in the industry. But there are still problems and complaints which you will occasionally see online, usually offered up by Prosper users who seem frustrated and angry. We’ll look at the most common problems below, as well as ways they can be avoided. Some Applications are Denied. When Prosper denies an application, this frustrates people to no end. But a denial should come as no surprise. Prosper doesn’t broker loans for borrowers with credit scores below 640. Users with higher scores are almost always quickly approved. For people with lower credit scores, this can be an uncomfortable situation. Prosper is often a resource for people who can’t afford traditional bank loans, or who have already been denied one. 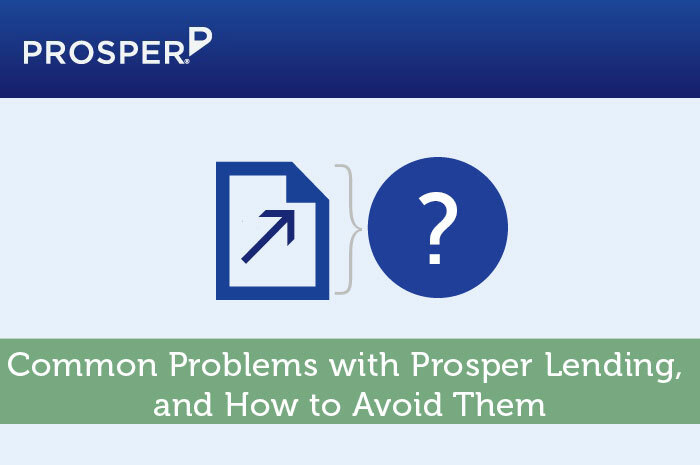 To have a Prosper loan request denied is frustrating, but is in keeping with clear terms that Prosper has on their website. The obvious answer is to work to improve your credit score. It may take some work, but a Prosper loan will be just one of many rewards! Monthly Payments Can Be Pricey. For some, a Prosper loan will be the first major borrowing event of their lives. In this situation, the cost can be surprising. Let’s say you borrow the maximum Prosper limit of $35,000 and select a 3-year term. Your monthly payments will be well over $1000. To some, this is too much to pay. Prepare in advance by calculating your costs and requesting only as much money as you absolutely need, and which you can afford to pay back. No one wants to default. Selecting a longer, 5-year term can also be a helpful way to lower monthly costs. Interest Rates Can Be High. For people on the low side of Prosper’s accepted credit score limits, interest rates can be sky high. Few can afford a yearly APR in the upper 20’s or even 30’s, so it’s best to only request a Prosper loan if your credit score is strong. Don’t make multiple borrowing requests prior to asking Prosper for a loan. Also, select a shorter term to enjoy slightly lower borrowing rates. Prosper Isn’t Available Where You Live. Prosper is available in almost all 50 US states. But because it has to set up regulatory agreements with each state individually, it is not universally available yet. Prosper’s availability is much more extensive than that of Lending Club, but if you live in an area where it is not available, you simply won’t be able to get a loan through Prosper. Prosper Contacts People in Danger of Default. If a borrower misses payments and is in danger of defaulting on a loan, Prosper doesn’t hesitate to call the borrower or even send the account to collections. Prosper’s customer service is always courteous and professional, but they can’t allow accounts to go unpaid, especially since lenders also make up much of Prosper’s customer base. The obvious way to remedy this problem is to borrow responsibly, taking on only as much debt as you can easily repay within the boundaries of your loan agreement. These are the primary complaints that Prosper users report. In each case, you can see that the customer carries at least some of the blame. No company is perfect, and legitimate problems have been reported with Prosper in years past. But with many years of growth and improvement under their belt, Prosper is more efficient and professional than ever. Borrowers can borrow with confidence, as long as they’ve taken into account all of Prosper’s rules for successful borrowing. Thus prepared, new users can expect fast provision of an affordable loan, with Prosper lending.